John Sheard owned the Gomersal Colliery Dronfield from 1874 until 1881, he is also mentioned in a case relating to Gosforth Colliery in 1890 which he also presumably owned after the Dronfield Silkstone Colliery Company went into liquidation after the closure of Gomersal Colliery (1874-1881). Top map Gomersal, bottom Gosforth. Gosforth Colliery SK 342784. Working in 1890. Gosforth Old Colliery SK 345782. Worked out by 1890. Gomersal Colliery SK 351780. Worked out in 1890. (Summary page 4, Col: 3). Davis and Shoesmith have received instructions from the Official Liquidator to sell by auction the loose plant and machinery etc. Hallowes sinking pit portable steam engine and boiler combined. The new and old collieries at Gosforth horizontal steam engine 14-inch cylinder. Two spare winding drums 10 feet and 8 feet. Two winding drums for flat ropes and spur wheels. Pit wagons or corves, round and square slack wagons, 1,300 pit props set of haulage gear by Oliver’s Chesterfield, 20,000 common bricks and wagon tippler. 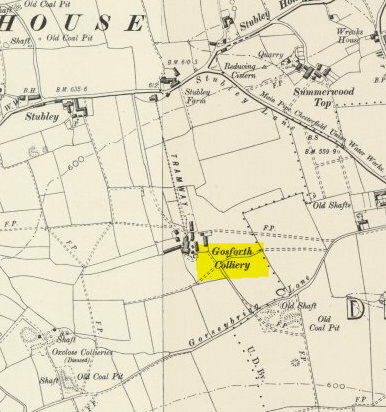 In The Chancery Division the Master of the Rolls had before him a claim in the winding up of the Company for £1,138 by the owners of the Somerbille Colliery, which adjoins that worked by the Company. The claim was to recover damages to the amount in respect of wrongful working beyond the boundary alleged to have taken place in 1878. On Monday at Eckington petty sessions before J.F. Swallow esq. and Major L. Butler-Bowden the adjourned case in which John Sheard proprietor of Gosforth colliery Dronfield and George Parkes manager of same were charged by H.M. Inspector of Mines. The prosecution was fully gone into at the last hearing, the case was adjourned for the prosecuting solicitor to produce the plans of the mine that he had forgotten to take the proper course to ensure their production at the last meeting. The charge was for neglecting to put a certain number of boreholes at a distance of not less than 5 yards in advance of certain working places. Fred Webster collier said he was boring during the month of November in the number 5 heading and he had only bored 4 yards when he came to water. John Moseley undermanager of the Gosforth colliery said on the 6th November he examined number 5 and number 12 headings. In the number 5 the centre borehole was only 4 yards and the number 12 was 3 yards 9 inches. He did not think that there was a dangerous accumulation of water in either place. Mr. Sheard was fined £10 plus 13/6d costs. Mr. Parkes was fined 1/- plus 13/6 costs. Mr. Busby mentioned the question of the Crown Court subpoena which they had been obliged to procure and he considered the costs ought to be borne by the defendants. The bench ordered Mr. Sheard to pay £1. This was one of the most serious cases that had been before the bench for years. The whole of the men employed in the pit might have been drowned. The hearing of the case lasted two and a half hours. Gosforth, Dronfield Silkstone Coal Co. Limited. Gosforth Dronfield Exors. of Mrs. Jane Sheard, Dronfield, Sheffield. Manager John Morte. Undermanager John Mosley. 95 men employed underground. 35 men employed on the surface. Coal mined, Household & Coking from the Silkstone seam. 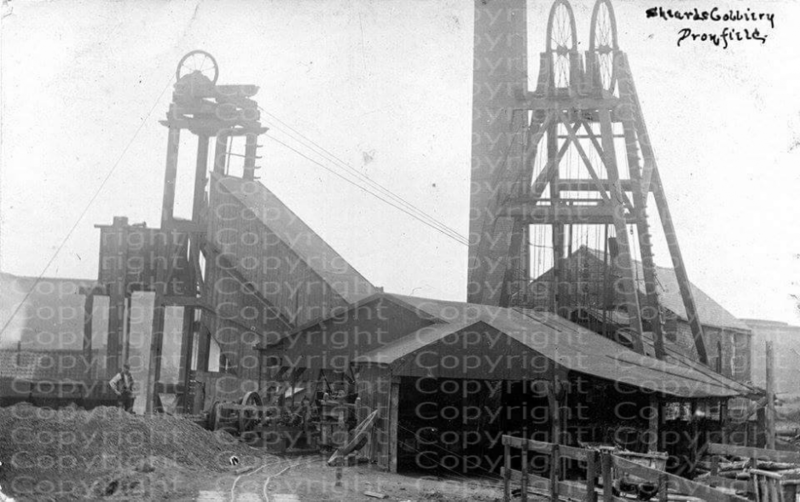 Photograph possibly of Sheards Gosforth Colliery. Photograph Copyright. Robert Gratton.